The overall health of Blackburn Bay has remained in good condition with two out of three water quality parameters, chlorophyll a and phosphorus, below their associated target levels. Nitrogen concentration rose sharply in the latter part of 2013, pushing the annual mean above target levels. Water Quality: All three water quality indicators (chlorophyll a, nitrogen, and phosphorus) were rated as pass (concentration below the threshold). The mean for chlorophyll a was calculated as an arithmetic mean and the means for nitrogen and phosphorus were calculated as geometric means (per the Numeric Nutrient Criteria outlined in the Florida Administrative Code, section 62-302.532). The mean chlorophyll a level (0.0054 mg/l) in Blackburn Bay has decreased and was scored as excellent, below both the target (0.006 mg/l) and threshold (0.0082 mg/l) levels. The mean nitrogen level (0.4201 mg/l) has greatly increased but still retained its “Good” score as it is below the threshold level of 0.430 mg/l. Phosphorus concentrations in the bay have remain relatively constant and low, with a mean of 0.0556 mg/l, below the target (0.1700 mg/l) and threshold (0.210 mg/l) levels and earning a score of “Excellent”. Biotic Indicator: Measurement of the biotic indicator, seagrass, is performed at two-year intervals and is due for monitoring again in 2014. 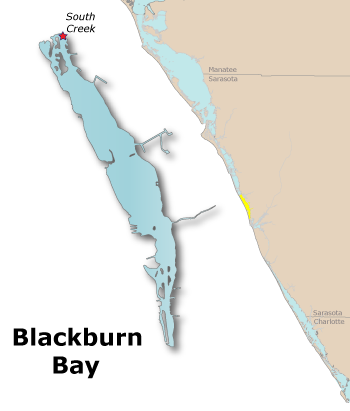 When last assessed in 2012, total seagrass acreage in Blackburn Bay was 324 acres, below the target level of 447 acres.